We had our monthly birthday celebration at the office last week. It involved queso, margaritas and music. And also champagne. At the end of the party, there was a half bottle of champagne that had no home. Couldn’t let it go to waste–renew, reuse, recycle–so I took it home with me. 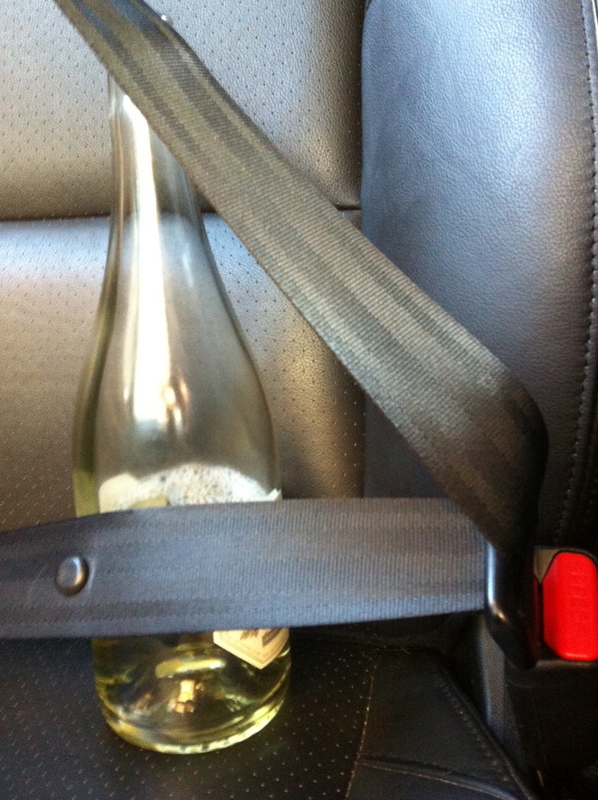 I’m all about safety (of my upholstery), so I strapped that baby into the passenger seat before making the drive. I’m glad I wasn’t pulled over by the over-zealous cops in our neighborhood. I wasn’t drinking and driving (I was drinking, THEN driving), but this certainly qualifies as an open container. James and I are leaving for our almost-annual pilgrimage to N. California soon. In addition to the travel binder we always take on trips, some new technology is coming along. My parents gave me a fancy iPad for my birthday last month, and it was already in the queue to take the place of my much heavier laptop (which I mostly use for checking email and writing trip notes when there’s a break in the action). We’re lightening the load on this trip. Physically and metaphorically. And I realized yesterday that an app on my iPad (Evernote) could actually be the collection point for many of the things I typically print out and put in the binder. I’ve been spending time this weekend creating google maps and saving webpages with tips about trails we’re going to hike. It’s a thing of beauty. Nerd happiness. I am positively a-tremble with the thought that I could power our drive to New Hampshire with an Evernote folder instead of my usual vinyl project sleeve full of color-coded print-outs & maps. I may prevail upon you for an Evernote tutorial … I tried to use it a couple of years ago but didn’t get into a groove and never quite made work right. I’m so happy you understand my joy. Still finding my way around Evernote. For the real deal, you need to buy the full version (I haven’t made that commitment yet, but I have a feeling I will before the day is over) so you can access everything offline – imperative for a cross-country drive. As is for this trip, I’m taking a binder that’s roughly half the size it normally would be, with some things in Evernote and others still on paper. Perhaps the next trip will be binder-free. Baby steps. Just did the upgrade. You can sign up for a year ($45) or pay monthly ($5), so I did the latter. Now I can access my entire folder on the plane and when we’re between wifi signals. If I decide I don’t need the offline access after the trip, I’ll just go back to the free version. Exciting! Was one of those birthdays yours? Happy travel! Happy Evernote!